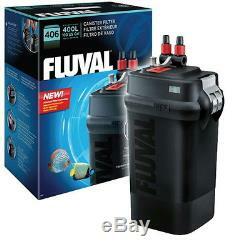 Fluval 406 A217 External Canister Filter up to 100 Gal. The newly refined Fluval 06 series of aquarium canister filters features a new, more powerful motor and adds extra conveniences to the powerful and flexible Fluval filtration line. Each Fluval Multi-Stage 06 Series Filter adds even more user-friendly features with a re-engineered, efficient priming system to ensure aquarium filtration is even easier to set-up, customize and maintain. Easy to Start A completely re-engineered priming mechanism makes the Fluval'06 child's play to get started. Just a few pumps of the new, strengthened priming handle and you're off and running. 15% More Power The new filters are more powerful than their predecessors without increasing power usage, thanks to some clever mechanical changes which allow the filter to work more efficiently. Each model now moves up to 15% more water than its predecessor for better circulation and cleaner, healthier water. Silence is golden The Fluval has always been a quiet filter, but now it's practically silent thanks to a completely re-engineered impeller and impeller cover. At the contact points between the impeller and cover sit tiny ceramic rings which are virtually friction free, reducing vibration and noise to a bare minimum for almost silent running. Easy To Maintain The patented Aqua-Stop system effortlessly stops water flow with no mess or leaks and the new, strengthened lift-lock handles allow easy access inside the filter. Quick-change mechanical foam media is easy to remove and the new Bio Foam media supplied (206, 306 and 406 models only) creates additional space for beneficial bacteria to breed. Attention International Buyers: All products are appropriately labeled and designed for sale in the US. Where applicable, electronics and plugs work with standard US 120 volt, 60Hz outlets, unless specifically stated otherwise, above. Within three years, the business had grown to fill the entire home before expanding into a 1,500 square foot storage space. The ValuePetSupplies website launched in 2007. By 2009, the company employed the entire Piech family including Zachary's wife Cate, sister Dana and father Tom. ValuePetSupplies now occupies 105,000 square feet of warehouse space in Livingston, TN with more than 40 employees working hard to deliver our signature bully sticks, puppy pads, and other supplies seven days a week. We are proud to be a family owned and operated American business. USA based customer service available 7 days per week. The item "Fluval 406 A217 External Canister Filter up to 100 Gal" is in sale since Monday, November 16, 2015. This item is in the category "Pet Supplies\Fish & Aquariums\Filters". The seller is "valuepetsupplies" and is located in Livingston, Tennessee. This item can be shipped to United States, Canada, United Kingdom, Denmark, Romania, Slovakia, Bulgaria, Czech republic, Finland, Hungary, Latvia, Lithuania, Malta, Estonia, Australia, Greece, Portugal, Cyprus, Slovenia, Japan, China, Sweden, South Korea, Indonesia, Taiwan, South africa, Thailand, Belgium, France, Hong Kong, Ireland, Netherlands, Poland, Spain, Italy, Germany, Austria, Russian federation, Israel, Mexico, New Zealand, Philippines, Singapore, Switzerland, Norway, Saudi arabia, Ukraine, United arab emirates, Qatar, Kuwait, Bahrain, Croatia, Malaysia, Brazil, Chile, Colombia, Costa rica, Dominican republic, Panama, Trinidad and tobago, Guatemala, El salvador, Honduras, Jamaica.